President Obama proposed a long list of changes to the tax system as part of his fiscal year 2016 budget. We used the Tax Foundation Taxes and Growth Model to determine the likely effect of the proposed tax changes on GDP, capital formation, employment, wages, and government revenues. We modeled two scenarios. The first includes no change to the corporate tax rate. 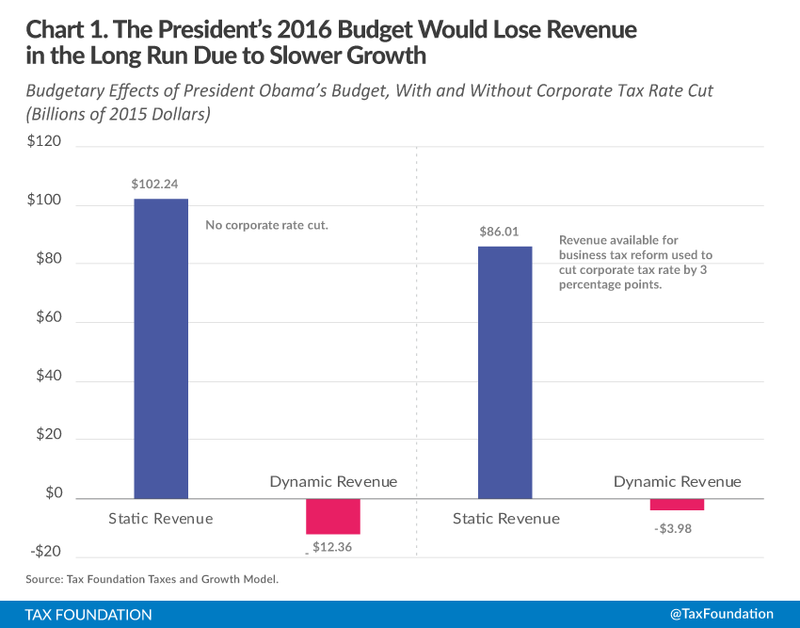 The second uses the revenue available for business reform to lower corporate tax rate. Under both scenarios, the plan shrinks the economy, lowers wages and investment, and reduces the number of available jobs. President Obama’s fiscal year 2016 budget includes a number of proposed tax increases on saving and investment and the creation or expansion of a number of tax credits. The Taxes and Growth Model finds the plan would shrink the economy by 3 percent, lower the level of investment by 8 percent, reduce wages by 2.4 percent, eliminate 809,000 jobs, and lose $12 billion in federal revenue over the long run due to lower growth. If the revenue available for business tax reform were used to lower the corporate tax rate, it would result in a 3 percentage point cut in the rate—far less than a cut to a 28 percent rate as hoped for by the president’s budget. With the lower corporate tax rate, the plan would still shrink the economy by 2.4 percent, decrease investment by 6.2 percent, reduce wages by 1.8 percent, eliminate 679,000 jobs, and lose $4 billion in revenue over the long run. The plan’s focus on redistribution instead of growth results in a reduction of growth that would hurt many people the plan is meant to help. President Obama proposes a long list of changes to the tax system as part of his fiscal year 2016 budget. The plan would reduce the level of GDP by between 2.4 percent and 3.0 percent, and cost between 679,000 and 809,000 jobs. The adverse outcome for growth and employment stems from the plan’s net tax increases on saving and investment. Those higher taxes are not effectively countered by the plan’s various tax credits and other give-backs, many of which would provide little or no incentive to add to output or capital formation. The thrust of the individual income tax changes is to raise taxes on upper income taxpayers, primarily through higher taxes on income from saving and investment. It achieves this goal by expanding taxable income, restricting deductions, and boosting taxes on estates and on capital gains at death. The revenue would be used to increase tax credits for families with young children, workers with low earnings, and two earner couples, and to subsidize low income savers. These provisions are generally capped in a manner rendering them ineffective in encouraging additional economic effort. The damage to growth from the individual tax provisions does not stem from taxing the rich; it stems from taxing saving and investment, which hurts capital formation, productivity, wages, and employment across the board, but especially in capital-intensive blue collar industries. The domestic business tax changes generally increase the tax burden on capital investment, except for favored industries granted larger tax allowances. The proposals include new fees and reduced deductions for a wide variety of businesses. This includes a shift from LIFO accounting to FIFO, which would affect inventories in corporate and non-corporate businesses. Banking and insurance would face new fees and expensive accounting changes. The fossil fuels industries would lose various cost recovery allowances and access to some foreign tax credits. Winners would include alternative energy producers, who would receive enhanced tax allowances. Other provisions would increase access to funding for projects undertaken or supported by state and local governments. A one-time 14 percent tax would be imposed on income from past years being held abroad on a tax-deferred basis by multi-national businesses, and the money would be used to bolster the highway trust fund for roads, bridges, public transportation, and recreational trails. This one-time revenue and spending increase would have no effect on long run GDP, except that the combination of its retroactivity and high rate might raise perceived risk and discourage future investment. A more permanent tax on foreign income, at 19 percent, without deferral, would apply to future foreign earnings, after a credit for foreign taxes paid. This provision would make U.S.-based businesses roughly competitive in foreign countries with tax rates roughly equal to the average for the developed world, but make them less competitive in countries with lower-than-average taxes. We used the Tax Foundation Taxes and Growth Model to determine the likely effect of the proposed tax changes on GDP, capital formation, employment, wages, and government revenues. The revenue estimates are presented on a static basis (assuming no changes in GDP) and on a dynamic basis (allowing for predicted effects of the tax changes on GDP). We modeled two scenarios. The first tested the proposals as they stand with the revenue increase held in reserve for some future unspecified business tax reform, that is, held back to reduce the deficit. The second applied the net static revenue from the corporate tax increase proposals to a reduction in the corporate tax rate. Due to the net revenue from foreign sources, this rate reduction slightly exceeded the implicit rate increase from the other revenue-raising provisions. The net corporate rate effect was not large enough to overcome the adverse effects of the increases in personal taxation of saving and investment. The revenue estimations in the president’s budget do not call for any specific corporate tax rate cut. Thus, with the revenue increases retained for deficit reduction, the president’s plan would reduce the level of GDP by 3 percent after all economic adjustments (taking about five to ten years). In the long term, the stock of private sector plant, equipment, and structures would be 8 percent lower than otherwise, wages would be about 2.4 percent lower, and there would be about 809,000 fewer full time equivalent jobs. All of the expected static revenue gains would be lost to reduced economic growth; GDP would decline by about $535 billion, causing federal revenue to decline by $12 billion in spite of the initial tax increases. The text of the president’s plan refers to a hoped-for 28 percent corporate tax rate under some future reform, which would be a 7 percentage point cut from the current rate of 35 percent. However, the proposed revenues from the plan which he would reserve for the future business tax reform appear to be sufficient to fund only a bit more than a 3 percentage point corporate rate reduction. If we were to assume that the business tax revenue were used to lower the corporate tax rate, the proposals would do less damage. Incorporating that rate cut into the President’s plan, we estimate that the proposal would reduce the level of GDP by 2.4 percent after all economic adjustments (taking about five to ten years). In the long term, the stock of private sector plant, equipment, and structures would be 6.2 percent lower than otherwise, wages would be about 1.8 percent lower, and there would be about 679,000 fewer full time equivalent jobs. All of the expected static revenue gains would be lost to reduced economic growth; GDP would decline by about $416 billion, causing federal revenue to decline by $4 billion in spite of the initial tax increases. For a century, the tax policy debate has revolved around two competing notions of the appropriate tax base—income versus consumption. The “broad-based income tax” seeks to tax saving and investment multiple times to aid in wealth redistribution (hitting income when earned, and then hitting the future earnings of after-tax income that is saved or invested, often more than once). An unbiased “neutral” or “consumption-based” tax (one that falls equally on income used for consumption or saving and investment) seeks to avoid penalizing saving relative to consumption so as not to discourage capital formation. The current tax system is a hybrid, with income and consumption elements. It taxes saving multiple times (including taxing earnings of saving done with after-tax income, the added double tax on corporate income, delayed depreciation allowances for investment, and an estate tax). However, it has provisions that moderate the anti-saving biases (tax-preferred retirement accounts, reduced tax rates on dividends and capital gains, an estate and gift tax credit, some expensing of investment or accelerated write-offs). In general, major tax bills that have moved away from the income base toward a neutral base—providing faster depreciation, lower corporate or shareholder tax rates, and lower estate taxes—have encouraged capital formation, raised productivity and wages, and raised employment. (Examples are the 1961-1963 Kennedy tax cuts, the 1981 Reagan tax cut, and components of the 2001-2003 Bush tax cuts.) Major bills that have moved toward the “broad-based income tax”—restricting the moderating provisions—have generally discouraged capital formation and reduced wages and employment. (Examples include the 1986 Reagan tax reform, and the Obama 2012 budget agreement and the tax elements of the Affordable Care Act.) These differing economic outcomes do not result from who gets taxed (rich or poor) but from what gets taxed (growth activities such as capital formation or work, or consumption). A progressive, graduated consumption tax is far less destructive of output and income than a progressive graduated income tax, because it does less to discourage everyone from saving and building capital. The President’s proposal attacks several of the tax features that moderate the anti-saving biases in the income tax, raises the cost of capital formation, and reduces job growth. The plan clearly focuses on redistribution rather than growth. The result is a reduction in growth and would hurt many of the people the plan is supposedly designed to assist. We used the Tax Foundation Taxes and Growth Model to estimate the economic effects of the president’s budget. The estimates are preliminary and somewhat rough, due to incomplete information about the details of some of the proposals, and due also to limited information in the IRS sample tax return data (the public use file) and other published surveys on the amounts and distribution of some of the items that the President wishes to add to the tax base. For example, there is no good data on the number of children under five by tax return (needed for the proposed increase in the child and dependent care credit), and we did not model the distributional effects of that provision. There is likewise no information collected in sample tax return data for some of the items the president proposes to include in taxable income for the first time. For example, we lack information on the value of employer-provided health insurance for upper income workers that the president would tax, or the distribution of retirement plans which have accumulated $3.4 million and would face restrictions on new contributions under the proposals. Where the Treasury has provided a catch-all revenue estimate for these additions to taxable income, we have boosted the marginal tax rates in the affected brackets to raise the indicated amount of revenue. We modeled the proposed increase in the capital gains and dividend tax rates, and adjusted realizations and revenue in line with generally accepted estimates on the long term effect of higher rates on the taking of gains. We have modeled the extensive list of corporate tax increases as an implicit tax rate increase, based on the Treasury’s reported estimates of the long run rise in revenue from these sources. The president’s plan would divert some of this revenue to subsidize favored industries which are otherwise uneconomical. These diversions were treated as transfer payments with no net benefit to economic output. For example, substituting higher-cost energy sources for lower-cost sources cannot be said to have increased the effective capital stock or national output. These are value reducing rather than value adding tax shifts. In the case of the corporate tax cut, the remainder of the revenue that the president would reserve for business tax reform and corporate tax rate reduction was treated as a reduction in the corporate tax rate. The 19 percent tax on international earnings was treated as falling half on the domestic parent (implicitly raising taxes on domestic expansion) and half on the foreign subsidiary (not directly reducing domestic activity) because domestic and foreign operations of U.S. multinationals tend to rise and fall together. In effect, half of the foreign source revenue was deemed to be available for lowering the U.S. corporate tax rate. Office of Management and Budget, Fiscal Year 2016 Budget of the U.S. Government (Feb. 2015), http://www.whitehouse.gov/sites/default/files/omb/budget/fy2016/assets/budget.pdf. 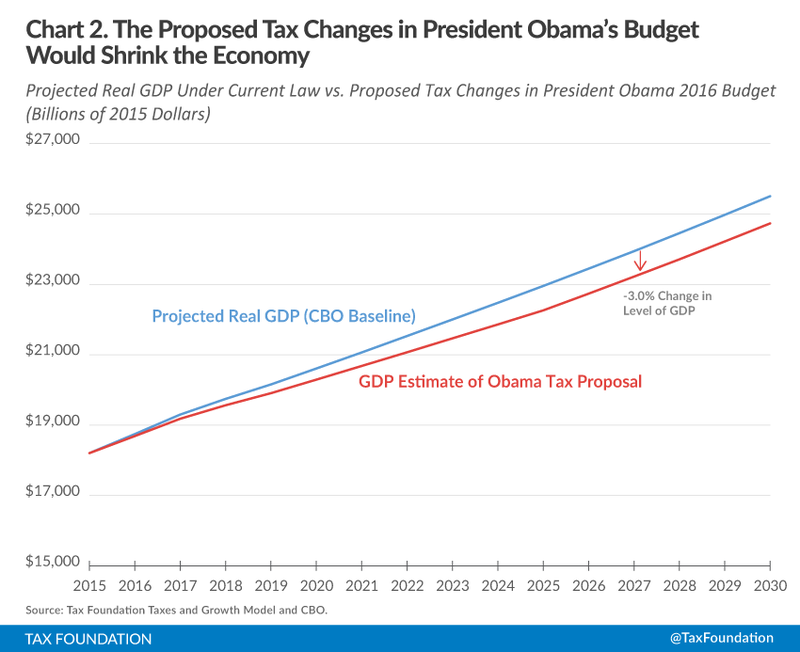 For a complete overview, see Andrew Lundeen, Proposed Tax Changes in President Obama’s Fiscal Year 2016 Budget, Tax Foundation Tax Policy Blog (Feb. 11, 2015), https://taxfoundation.org/blog/proposed-tax-changes-president-obama-s-fiscal-year-2016-budget. 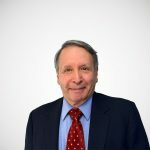 Alan Cole, Incorrectly Defining Business Income: The Proposal to Eliminate the Deductibility of Foreign Reinsurance Premiums, Tax Foundation Fiscal Fact No. 452 (Feb. 18, 2015), https://taxfoundation.org/article/incorrectly-defining-business-income-proposal-eliminate-deductibility-foreign-reinsurance-premiums. Kyle Pomerleau, The President’s Tax on Offshore Earnings Represents the Worst of Retroactive Policy, Tax Foundation Tax Policy Blog (Feb. 2, 2015), https://taxfoundation.org/blog/president-s-tax-offshore-earnings-represents-worst-retroactive-policy. For a discussion of the TAG Model, see Michael Schuyler, The Taxes and Growth Model—A Brief Overview, Tax Foundation Fiscal Fact No. 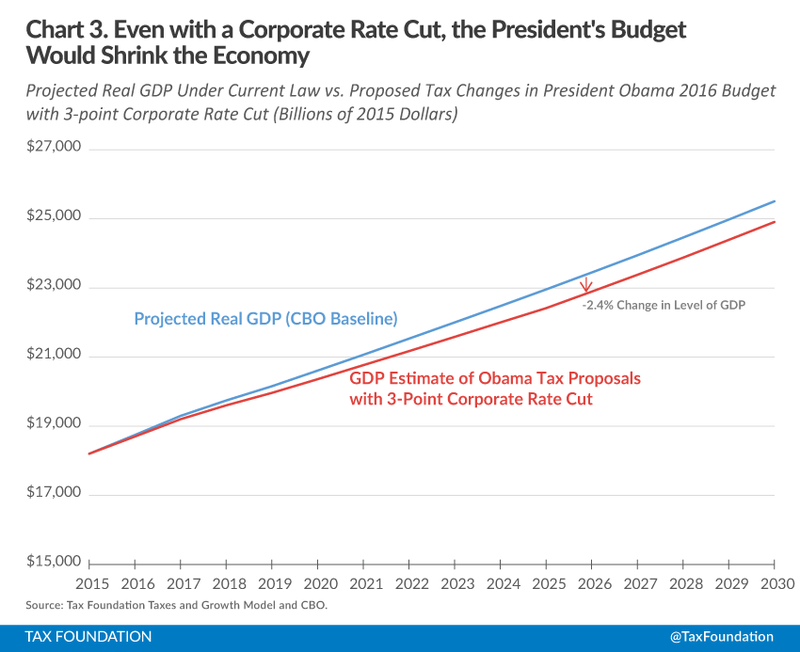 429 (May 6, 2014), https://taxfoundation.org/article/taxes-and-growth-model-brief-overview.